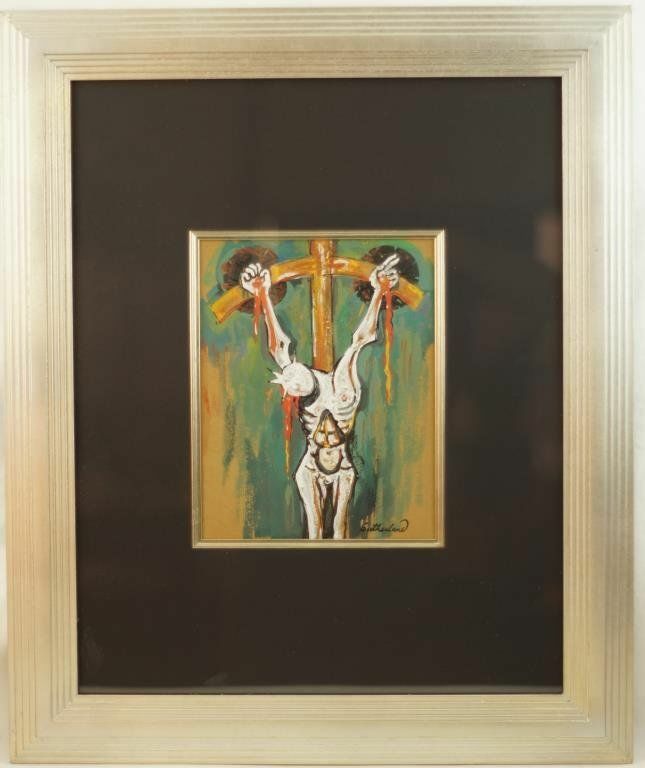 Graham Vivian Sutherland ( UK - 1903-1980) "Crucifixion", original Mixed Media on Paper - Size: 8 ins. x 6 ins. Stunning piece in excellent condition. Hand-signed "Sutherland" bottom right. Graham Sutherland (1903-1980), the leading painter of the English neoromantic movement, was noted for his imaginative pictures based on landscape and plant forms and for his portraits. Graham Sutherland was born in London on Aug. 24, 1903. He studied at Goldsmiths' College of Art, London, specializing in engraving, and worked until 1930 as an engraver of landscape subjects in the tradition of Samuel Palmer. In 1935-1936 Sutherland found himself as a painter, partly under the influence of the landscape of Pembrokeshire. This was also the period when surrealism made a big impact in England, and he combined surrealist elements with the romantic landscape tradition. Objects such as the roots of an uprooted tree seen in violent foreshortening were given a mysterious, ominous, monster-like character, the impact being enhanced by strong, unrealistic colors. During part of World War II Sutherland was an official war artist. He made a series of remarkable paintings of bombed buildings which vividly captured the drama and tragedy of the devastation, as well as studies of iron foundries and coal mines. Most of these works were predominantly black. However, by 1944 he began to use bright colors again in a series of imaginary landscapes, including a very distinctive range of orange, mustard, and pink. Many of these were executed in watercolor and gouache, which he used extensively for his smaller works and studies for oil paintings. 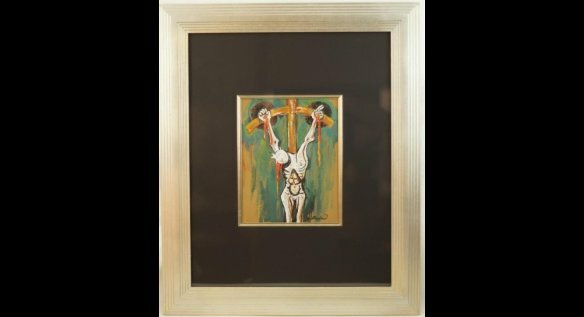 Sutherland's work began to take a new turn when he received a commission in 1944 to paint a Crucifixion for St. Matthew's Church, Northampton, a picture he executed two years later. In this work Christ's body, suspended in torment against a purple background, becomes a powerful image of physical and spiritual suffering. While planning this picture, Sutherland became fascinated by thorn-bushes, whose thorns reminded him of the crucifixion of Christ, and he painted a series of "Thorn Trees" and "Thorn Heads" which paraphrased the crucifixion. This procedure of evoking the presence of a human figure through a kind of substitution became characteristic of a great deal of his subsequent work. From 1947 Sutherland spent much of his time in the south of France and often painted motifs characteristic of that region, such as vine pergolas and palm palisades. The motifs are usually isolated and set against a strongly colored background in a shallow picture space; they tend to be amalgamations of plant and animal forms, of a definitely organic character. By 1949 Sutherland had begun to feel the need to narrow the gap between his series of "Standing Forms" and the human figure, and this led him to paint his first portrait, that of the novelist Somerset Maugham (1949), shown seated like an Oriental sage. Some of his other portraits included Edward Sackville-West, Helena Rubinstein, and Lord Clark. When Winston Churchill was in his eighties, Sutherland painted his portrait, which had the look of a befuddled bulldog. Churchill openly reviled the work, and the portrait was destroyed. ARTnews Magazine stated, "that act has guaranteed Sutherland a place in any history of art vandalism." Although Sutherland received a number of portrait commissions, the greater part of his output was still based on landscape and plant themes. He also painted a series of animals and of machine forms. Sutherland's most ambitious work of the 1950s was his design for a vast tapestry, Christ in Glory in the Tetramorph, for the new Coventry Cathedral, a project that occupied him from 1952 to 1958 and for which he made a large number of studies. Sutherland's work slowed considerably during the last 20 years of his life. During the 1960s and 1970s, he continued working, occasionally doing exhibits, but not producing the grand tapestries on the scale of the new Coventry Cathedral. His 1950s style never changed. His outdoors depictions continued to be overcast and gloomy, with eerie trees, nasty expressions, tortured landscapes, and angry plants. Sutherland's last exhibition occurred in London just a few months before his death. Art critic William Feaver wrote, "although fashion inevitably passed him by, this had no effect on his way of seeing. Style-bound maybe, he did at least have style, a capacity to turn things into his mechanized idiom." Sutherland died on Feb. 17, 1980 in London.